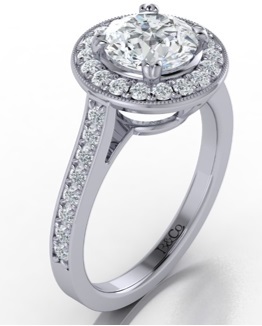 Proceed to the Quote Request form page and complete the form to receive a BEN & Co Designs complimentary price quote from one of our sales executive. There will be additional questions telephonically to give us more specs and understand for your design Request. BEN & Co Designs will then provide a quotation via email as no quotes are provided over the phone, and should you call us for a quote we will direct you to the quote request form. Ben & Co Designs will keep all your information strictly confidential and secure, and will not send any promotional announcements and marketing and advertisements unless you sign up for it. When it comes to making beautiful jewellery, BEN & Co. believes no detail is too small to be ignored or over looked. 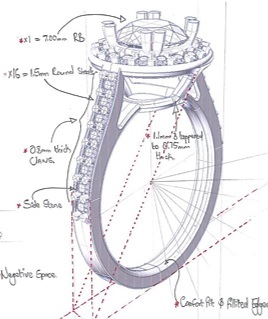 It all starts with a technical drawing sketch, our master Designer will take your ideas to draw a free-hand version of you unique jewellery ring design idea. 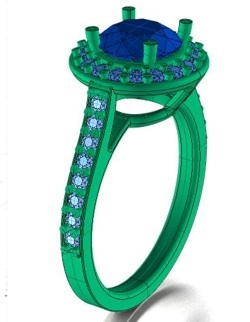 All your unique dream design ideas is interpreted or translated to a drawing, and our designer can also give professional technical opinion of what will and will not work together so you can tweak your design to create the perfect jewellery item. That is followed by few other design concepts until a design is approved by client. Upon the clients final design approval, BEN & Co designers carry the drawing to Computer Aided Design (CAD) which displays multi-angled renderings of your design. What makes BEN & Co Design different is that we provide our clients with a second approval for their unique design by emailing rendered presentation. 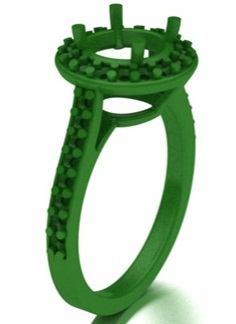 This also gives the client surety of how their ring will look like once finished. This is the WAX printing phase. A prototype that has been designed using CAD will be printed in a 3d wax that will be grown into a full-sized Wax model of your new design. The wax model is full-scale, that will allow the client to see the exact details and dimensions of the design as per discussed and confirmed with client. Should you desire to view your Wax, so that you can get a sense and feel of how your design will look before your Jewellery design is finished we are happy to courier it to you. As soon a BEN & Co Designs receives your final approval, the production phase begins. The wax is then casted in to your choice of metal type and finger size and all the specs that you initially selected. During this exciting and critical stage, it will be finished by out master goldsmiths expects and becomes the perfect piece that you have always dreamed of. After all this is done, your dream jewellery item still makes one more trip through quality control and hand-machine polishing before it can be delivered and worn. Once delivery has been made your may now being enjoying your dream jewellery item.